DC Comics Publishers Dan DiDio + Jim Lee join us from 4:00-5:00 PM on Saturday, November 18, to celebrate Justice League Day the #HoustonStrong way! To accommodate as many fans as possible, the signing is limited to a maximum of 2 items* per person. 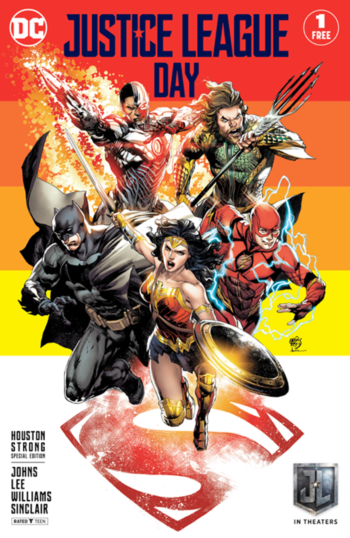 A limited number of free Justice League Day comics with a special Houston Strong variant cover also will be given away, all signed by Dan DiDio, Jim Lee, and Geoff Johns. Limit 1 per person. *If demand is overwhelming, we reserve the right to limit this to 1 item signed per person to give more fans the opportunity to meet our guests and get an item signed. This entry was posted in Event, Signing. Bookmark the permalink.